I've made a couple of quilts before, and it's mostly been trial and error. 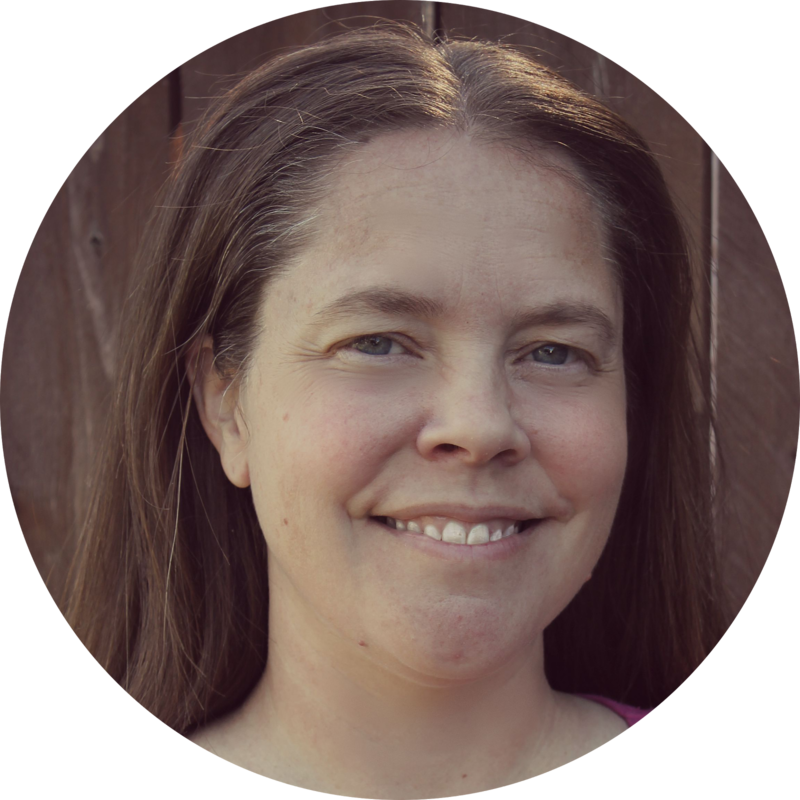 I've read a few tips here and there and gleaned a bit of information from quilting books, magazine articles, and blog posts. It's something that I've always wanted to do more of, but have been a bit intimidated. Until recently. 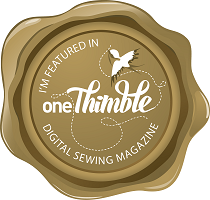 One Thimble Issue 8 was released and I knew I HAD to try the Oasis quilt pattern that was included in the issue. It was labeled confident beginner, and I have had this amazing fabric from ModKid in my stash. I bought it with a quilt in mind, so I decided to go ahead and jump right in. My quilt top turned out pretty well, and I'm proud of it. I added an additional strip of fabric to the top and bottom to make the quilt a bit longer. I also added a strip of fabric to each side of the quilt to make it wider. The original finished quilt dimensions were approximately 52 inches by 38 inches, and with my additions it ended up being 43 inches wide by 63 inches long. The instructions for this quilt were amazingly well written and easy to follow. There were illustrations for each part of the process. All dimensions and measurements were stated clearly. Finished measurements were also given for each part of the project. This helped me to know that I was right on track with my sewing. When making a quilt top, it is critical to sew the exact seam allowance. For this quilt, the allowance was 1/4". It is also critical to cut the strips the exact size. This was easy to do with my rotary cutter and cutting mat. Altogether I pieced and layered the quilt over a period of 3 days, working diligently for a couple hours each day. 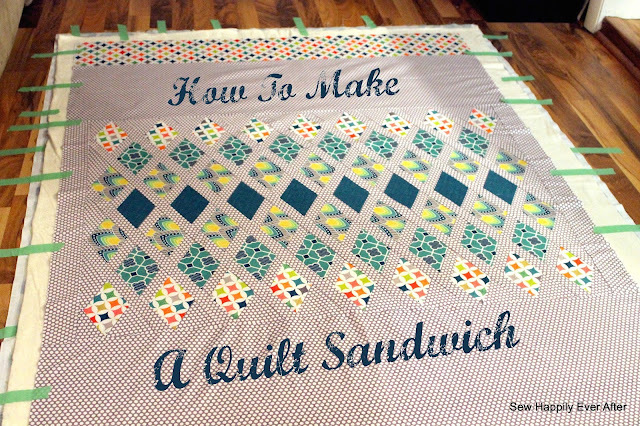 Before I made my quilt sandwich, I pressed both my backing fabric and my quilt top. I used a light steam setting on my iron in order to set the quilt top. First I took my pieced backing fabric and layed it out on the floor wrong side up. I used painters tape to keep everything lined up and in place without sliding around. About piecing the backing fabric: I sliced my backing fabric 10 inches from one edge and inserted a 6 inch strip of contrasting fabric between both of the backing pieces. This ensured that my quilt backing was wide enough to extend several inches past the sides of my quilt top. Next I placed the batting fabric right on top of the backing fabric. I centered the batting evenly around the backing fabric. You can see there was some backing fabric peeking out from under the batting. Again painter's tape holds everything in place. For this quilt, I chose a 100% cotton batting from Pellon. I thought about using white flannel as a batting to make a nice and light, but still warm, quilt. But since I'm not that experienced with quilt making, I thought I better play it safe and use an actual batting. There are a plethora of choices of batting at JoAnn's. It was tough to choose one. If you have more experience than me, I'd love to know your thoughts on batting. Finally I centered the quilt top right side up on top of the batting. A few pieces of tape secured it in place. A few months ago I invested in some curved safety pins. I knew that eventually I would be making a quilt, so I purchased them when they were on sale. I placed safety pins strategically throughout the quilt. OK, who am I kidding? I used every pin that I had and randomly pinned them through my quilt sandwich. I probably should have used a few more pins, but it feels pretty secure. Now all that's left is to quilt the quilt, trim the edges, and bind it. 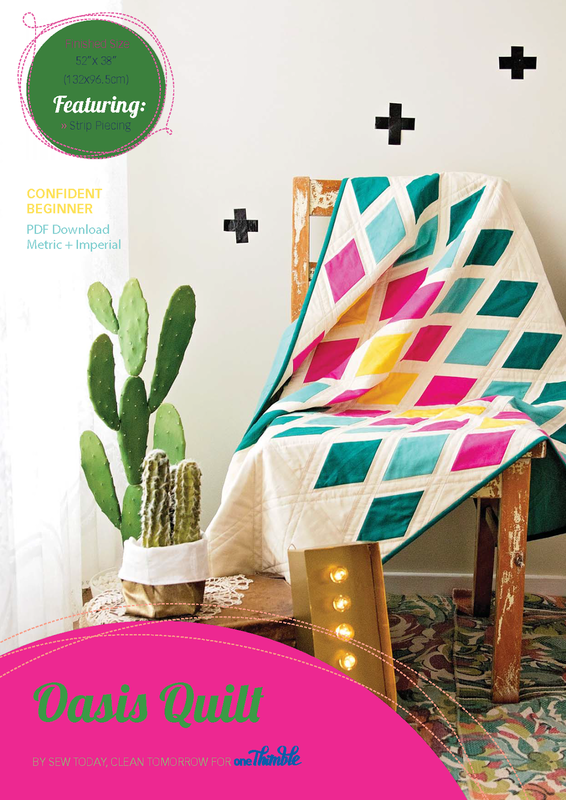 A favorite book that I have with seemingly all the information you could ever want to know about quilting is Quilting The Complete Guide by Darlene Zimmerman. This book is extremely helpful with charts, how to guides, and different finishing techniques. I especially like the section on how to bind quilts. 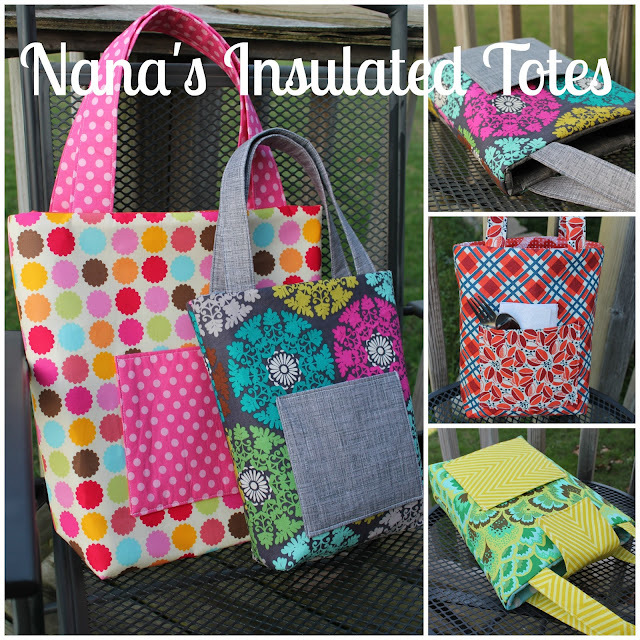 Also included is information on different batting types and how to care for your quilts. Have you made any quilts? 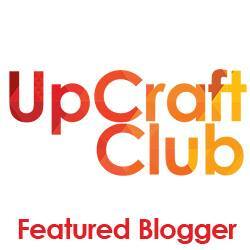 Or do you have tips or advice about quilt making? I'd love to hear about your experiences! and while you're at it, you could hop on over and like my Facebook page: Sew Happily Ever After.